In India, Mithai is closely associated with festive spirits.Every occasion or festival, calls for a celebration with these sweet delicacies. The base of this sweet is Singhar (sev or fried Strings of besan/gramflour). But this recipe calls for non salty sev (hmmm…..now where to hunt these?). So if you are lucky enough to get your hands on some unsalty sev…..grab them… and make this mithai in jiffy.Wait…there is one more hitch (one more…huh?) It also calls for feeka maawa (unsweetened mawa), which is nothing but milk boiled and reduced till granulated form is achieved. In India one can get this mawa without much hunting, but for other places around the globe, it could be hard to locate mawa. In that case you have the choice of making it at home by reducing the milk on low flame (might take as long as 2 hours to reduce 1 lit of milk) till grainy consistency is obtained. In a thick bottomed pan take approximately one and half cup of water and add sugar. Heat it and mix properly till sugar melts. Now add yellow colour if using, along with sev and mix gently, taking care not to mash the strings. Add unsweetened mawa and mix again till a thick mixture is formed. Finally add few drops of essence, mix and immediately take off from fire. Take a plate with flat surface or a baking tray and grease it slightly with vegetable oil. Pour the mithai mixture on greased surface and spread out evenly. Use chopped almonds/unsalted pistachios or silver varq to garnish. Let it cool properly, and then cut it into desired shape. Consume it within a day or two. OMG so easy, I thought it would be too complex. I guess salted sev will take the flavour to next level. Will try and let you know. Love it! Ordered some from Areeva Foods from Oak Hills Virginia and they shipped it to me via mail fresh in couple days! The taste was authentic and super fresh.. and not as greasy as some of the stores have it in India. Thank you Areeva Foods! Dear Alka, you run an inspirational blog and we have enjoyed reading it for quite a while and be motivated from it. We recently taked about our introduction to Sev Barfi in a blog post about one of the vendors in pune we get it from we were absolutely tempted to include your recipe link for those who wanted to try it on their own. I hope its okay to do. Thanks for a delightful recipe. The singar mithai was really easy to make & tasty too. If you live in North America Singhar Mithai is now commercially available from Areeva Foods in Washington DC. We’ve spent the last 2 years to re-create the very original and authentic taste from the most fresh ingredients. We are seeking and developing local retailers around North America, in the meantime eager connoisseurs can order it from us directly. Contact us directly at info@areevafoods.com / 703.829.7755. No Karishma, I haven’t found unsalted sev here in CA as yet. I’ll keep looking…. This is regarding the mava, one of the ladies enquired in the above posts. If we don’t get fika mava from stores, we can prepare some at hom in a jiffy. We can take some whole milk powder and add some ghee and rub it in softly till the mix resemble bread crumbs. Now you can knead this mix with water or fresh milk ino a soft dough . Keep it covered for abt 10/15 mins and you have mava ready. Use it as per your requirement. 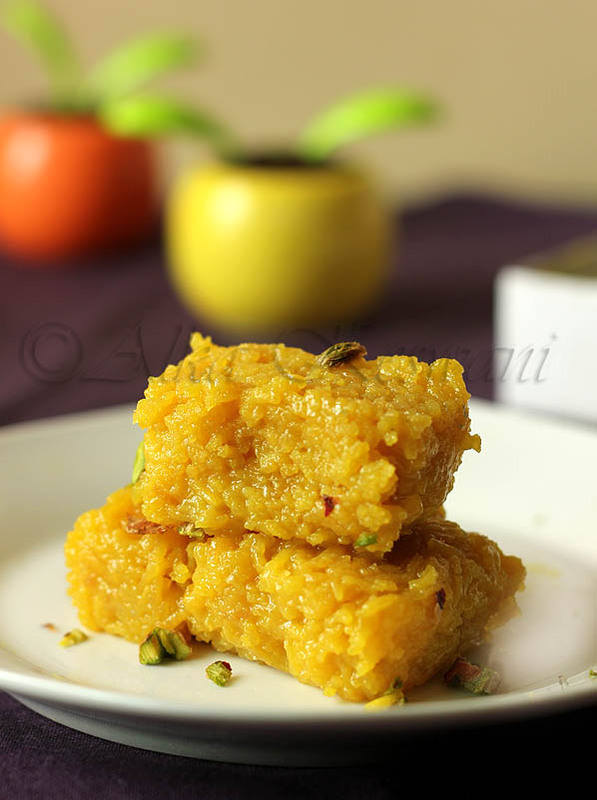 I made this singar ki mithai with this mava, and it turned out fab ! Also I used Kewra instead of rose essence. Thanks Alka once again for sharing you receipes, I just love them. This is one of my favorite sweet, I hope they should start selling in New Jersey. actually a restaurant named kailash parbat has opened in new York.i know them from Mumbai.they make the best singar mithai.but I am not sure if they have it here too.i simply love it.but have not been lucky to find the salt free sev in Orlando. unsalted sev is also known as vermicelli, you’ll get theem easily anywhere. How did u make home made unsalted sev, please please please share. My mouth waters. Unfortunately here in Calcutta Sindhi Mithai shops have closed shop a long time ago. Lovely recipe. However, I haven’t been able to find unsalted sev in the indian store here in California. Can you please tell me where to find unsalted sev? I am in California, did u find any store that has unsalted sev? 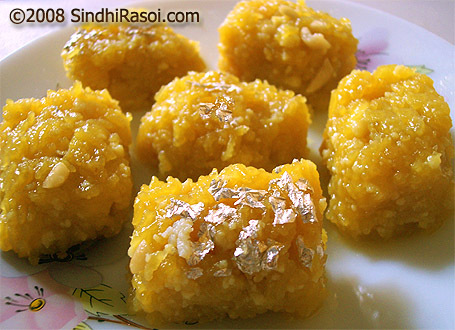 I was so sad today because my mom was not able 2 send me singhar ki mithai for diwali as it gets spoiled pretty soon. But your recipe sounds simple (hope it is for me…because I m not that gr8 at cooking)….so I am going to try to make some. Thankz a lot. Absolutely tempting Alka! I have an odd question: is this mixture ever rolled into ladoos? the picture reminds me of having this singar halva in Shikarpur once. I had thought at the time that singar was a vegetable! Now I realize that I was confusing singar with the vegetable sangar. Thanks for the lovely recipe. i remember waiting in queue in khar, bombay for a this at a shop that only sells it on sundays. Hope u got my mail on that ! 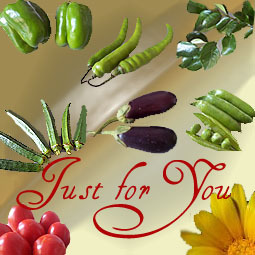 Thanks for ur comments,i m seeing fantastic recipes on ur blog daily…u r rocking gal! Thanks for ur appreciation..it matters a lot to me! Thanks for the info,u provided,i try hard to know what every dish or ingredient i use is called in other regions and religions.Wikipedia do help me,but inputs from fellow bloggers are most treasured ones! Wow great recipe. 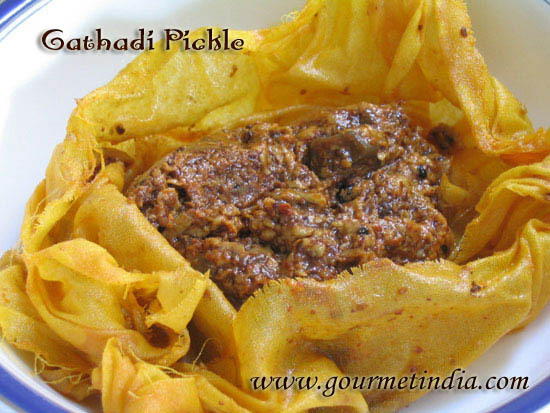 my hubby love this methai. We have a similar recipe in southern India. It is called “Monaharam” or “Manoharam”. Those who hail from “Tirunelveli” District make a thick fritters out of gram flour. Those who hail from “Thanjavur” District will make the fritters out of Rice flour. The syrup is made up of Jaggery. OK! I have a question. Is it good to replace the Mawa with Non fat dry milk powder? Alka I love Singhar Mithai, yummmy … I now am missing this. My fav are from chennai, in a place called Kilpauk next to sindhi darbar. We always get some from there when I am in chennai. It looks amazing and mouthwatering. Your sweet looks simply perfect. Man I never made this perfect sweet looks so yummy. I really really wanna grab one. Can I? I’ve had a lot of singhar ki mithai in Bombay- my hubby n I literally fight over it. The rose essence adds a freshness to the taste. Alka, What a lovely blog you have. And how wonderful to find a Sindhi food blog. I must confess I’m not very familiar with Sindhi food, so this will be a great resource for me. omg alka..you are just too much..how can you cook something soo so yummy…:)..it looks fit to wipe off the screen..where do you live?..just wanted to know if you can parcel me some..seriously I mean..
this looks yummy…nd new for me ..thnks for sharin..
that really looks yummy. i think i never had it really . I have some store bought sev at home , will that do ??? wow! this is great…the pic really makes me drool…i made kaju katli yday and this sweet is really tempting too…..first time here and luved ur template…..